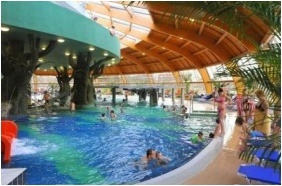 Aqua-Palace Covered Experience Bath constructed in Hajdúszoboszló, as part of the biggest bath complex in Europe. The experience bath has an area of 15000 m2, a water surface of 1600m2, and able to receive 1000 persons at the same time. Services of Aqua-Palace: Experience bath system to those wishing for a special, thematic bath environment, and unique wellness experiences: Tropical bath, Ice cave bath, movie bath, Pávai thermal bath, cave bath, Roman bath, Ganges bath, sea bath, and slide pool. Bath for children and families – Special offer in Hungary for families with young children:Pools for babies, mothers, and baby swimming, activity and resting rooms for children, nappy change room for the youngest family pool, Jacuzzi and 2 children’s slides for older children. Sauna system for the followers of healthy lifestyle: Finnish saunas, sweating rooms, infrared saunas, massage shower, plunge pools. Private baths for families and companies of friends:3 private bath units with Jacuzzi and sauna. 2 stand up surfing tracks for the lovers of water sports. Swimming pool, gym, aerobic room, 2 squash courts for the lovers of active relaxation. Beauty saloon: chiropody,Lying and standing solariums, Dermalife. thai massage, alternative massage types, to those wishing for some pampering wellness feeling. Snack bar, self-service restaurant, coffee bar for the lovers of delicious snacks.